The Alliance to End Chickens as Kaporos along with 20 additional plaintiffs has filed a lawsuit in the New York Supreme Court New York to issue an injunction against Hasidic rabbis and synagogues in Brooklyn from participating in “Kaporos,” a highly controversial religious custom which involves the confinement, torture and barbaric slaughter of more than 50,000 chickens on public streets every year during the week preceding the Jewish holiday Yom Kippur. The case also names the NYPD, NYC Department of Health and the City of New York for failing to enforce city health laws and animal cruelty laws, among others. The Alliance to End Chickens as Kaporos was formed in New York City in 2010 as a project of, and under the umbrella of, United Poultry Concerns, founded by Karen Davis, PhD. Kaporos using live chickens is also practiced in other cities in the U.S. including Los Angeles, where attorneys filed a similar lawsuit in August to prohibit the ritual. The 21 plaintiffs are a group of individuals and residents of the subject locations who have endured the inconvenience, nuisance, filth, stench, public health risk and emotional trauma involved in Kaporos for years. Each plaintiff is gravely concerned about the health risks in their community, the contaminants on the streets and sidewalks and the emotional trauma caused by the bloody animal violence they are forced to witness. Kaporos is allegedly a ritual of atonement practiced by Hasidic Jews as part of the Jewish holiday of Yom Kippur. The ritual involves practitioners grasping live chickens by their wings and swinging them above the practitioners’ heads. The purpose of this act, followed by the slaughter, is allegedly to transfer the practitioners’ sins and punishment to the birds, allegedly absolving the participants of their sins. 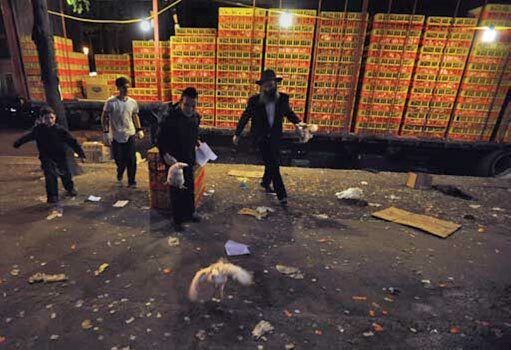 In order to conduct the slaughter of the birds, Kaporos involves the erection of makeshift slaughterhouses on the public streets and sidewalks of the City of New York. Dead chickens, half dead chickens, chicken blood, chicken feathers, chicken urine, chicken feces, other toxins and garbage such as used latex gloves and filthy tarps consume the public streets. There is no oversight and no remedy for cleanup. Michael J. McCabe, Jr., Ph.D., DABT, ATS, an expert on matters involving toxicology, microbiology, immunology, human disease causation and environmental health sciences, states that the events involved in Kaporos constitute a substantial public health risk that could have catastrophic consequences. In his 25 page affidavit, Dr. McCabe warns that the Kaporos activities put the public at risk for unacceptable exposure to known toxic and infectious biohazards. He says that handling poultry is a source of infectious disease for humans, and the activities of Kaporos put participants and nearby residents at risk for Salmonella, Campylobacter, and avian viruses including certain strains of influenza and other bacterial pathogens such as Arcobacter, Chlamydophila and E. coli. All of the plaintiffs witnessed chickens being tortured, unjustifiably injured and maimed, and deprived of food and water. Chickens are usually grabbed by their wings, sometimes three birds at a time. According to veterinarian John Hynes, DVM, this causes ligaments to rip and wings to break, causing extreme agony for the birds. Meanwhile the birds are packed tightly into transport crates and stacked up to 10 crates high, with no protection from the elements, no food or water, and excrement constantly falling on them from the birds above. The birds often die of heat prostration, dehydration and starvation before they are ever used. Plaintiffs have witnessed garbage bags on the city streets moving only to find dying and live birds inside slowly suffocating to death. There is an easy solution to this needless cruelty. Kaporos practitioners can swing coins instead of torturing birds. On August 25, 2015, the case was heard in the New York Supreme Court, NY County. Oral arguments were presented from all sides. The judge reserved decision until September 10, 2015. The Alliance to End Chickens as Kaporos is a project of United Poultry Concerns. Formed in New York City in June 2010, the Alliance is an association of groups and individuals who seek to replace the use of chickens in Kaporos ceremonies with money or other non-animal symbols of atonement. The Alliance does not oppose Kaporos per se, only the cruel and unnecessary use of chickens in the ceremony. To learn more about the Alliance, go to www.endchickensaskaporos.com.